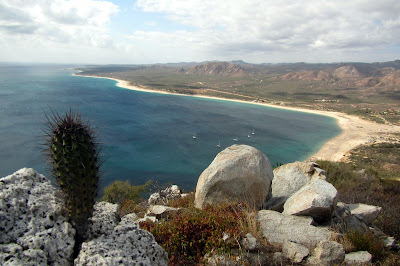 The Revillagigedos (ray-VEE-ya-hee-hay-dose) Islands, which were designated as a UNESCO World Heritage Site in 2016, are a remote archipelago about 300 miles west of Mexico’s mainland and about 250 miles south of Cabo San Lucas. These islands have held an allure for us ever since we heard fabulous stories from other cruisers of its prodigious collection of diverse marine life. One cruiser told us of swimming with giant manta rays who would circle their boat, waiting for them to get into the water and then allow them to hold on to their ‘heads’ and take them for rides. The manta rays seemed to be aware of how the cruisers were equipped: If they had on scuba gear, the mantas would take them deep, however, if the cruisers had only donned snorkel gear, the mantas would stay near the surface and allow their ‘passengers’ to get air frequently. According to these cruisers, the manta rays would return them to their boat when the ride was over. We had no reason to believe this was a fabricated story and we withheld our opinion that it’s inappropriate to touch wild sea life. 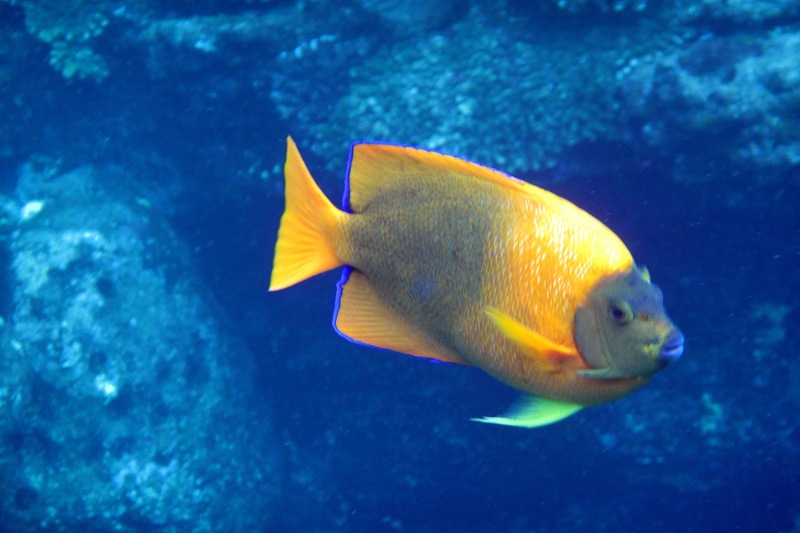 But the marine life notwithstanding, the appeal of uninhabited islands far from any shore was a strong enough calling which we could not ignore. 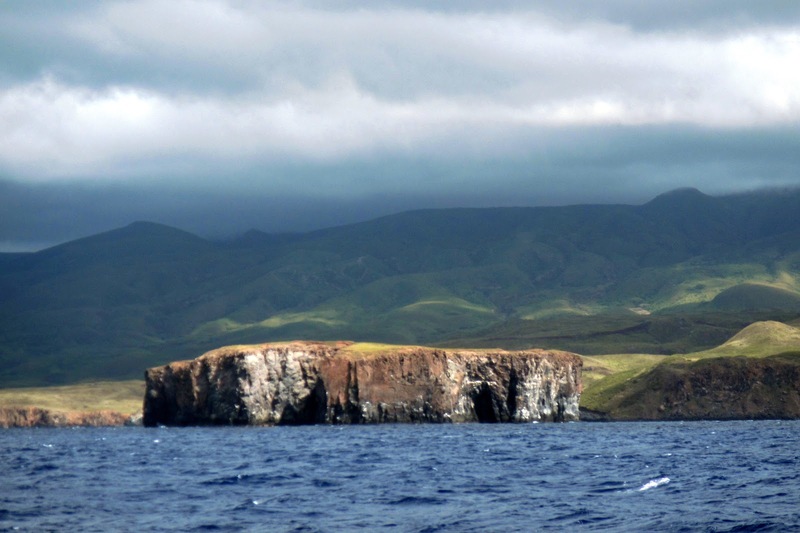 The four islands, Clarion, San Benedicto, Roca Partida and Socorro, are Mexican and since they’re also a carefully guarded marine reserve, special permission must be obtained before venturing there. We knew of dive boats in San Diego, our home town, that would make the 900-mile passage and, once on a visit home, we contacted several to see if they could shed some light on how to go about gaining permission to visit. Though they seemed willing to help, their descriptions of the permit process were discouraging. It wasn’t until we returned to the large cruising community of Banderas Bay that we found other cruisers who had successfully negotiated the permit process and were highly encouraging of us making the trip there. First a National Park permit had to be obtained (download the app) and a fee had to be paid. Second, send off a series of letters in Spanish to the governing agency in La Paz, promising, among other things, to not fish or go ashore, and wait for their reply, granting permission. Wait. Make follow up phone calls. Wait. More phone calls. Wait. Then, miraculously, the email appears, which allows you to sail west to another unknown destination. The weather off Mexico’s western Riviera had been unusually benign and we waited until there was wind forecast before we left Banderas Bay. However, even after using nearly a half-dozen on-line forecasting sites and enlisting the help of a weather guru in La Cruz de Huancaxtle, we still found ourselves motoring, despite the forecast for northerly winds of 10-15 knots. Eventually, the wind did fill in except it was out of the westnorthwest, making it a close-hauled tack, one of our least favored points of sail. Still, we were making good time and the seas were relatively flat. After about 48 hours, Isla San Benedicto was in sight and when we arrived at one of the anchorages, our 56-hour passage was completed. Isla San Benedicto rises straight up out of a very deep ocean and about a mile offshore it’s still over 2,000 feet deep. 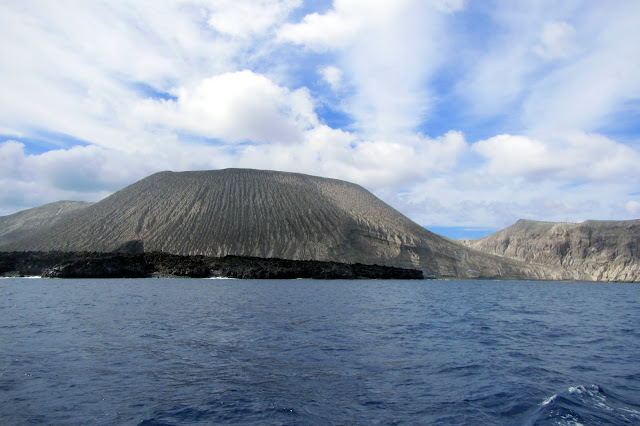 The island itself is a moonscape devoid of any vegetation, a solid mound of volcanic ash, with thousands of valleys carved down its gray, 2.5-mile length. We dropped our anchor in what had been described to us as an acceptable anchorage but after a minute, we pulled it up and went looking for something with less swell action. On the south end of the island is another anchorage and it was obviously preferred as there were two other boats there, the 105-foot, Undersea Hunter, clearly a dive boat and the 236-foot, Rocinante, an elegant, gleaming megayacht. Unfortunately, Rocinante was anchored right where our friends had told us to drop our hook and with their size, they took up a large percentage of the anchorage (their beam is equal to Rutea’s length). We pulled in as close as we felt comfortable but when we dropped our anchor it landed on rock. By this time it was getting late in the day and finding another anchorage was nearly impossible. We tried reanchoring but again could only find rock. 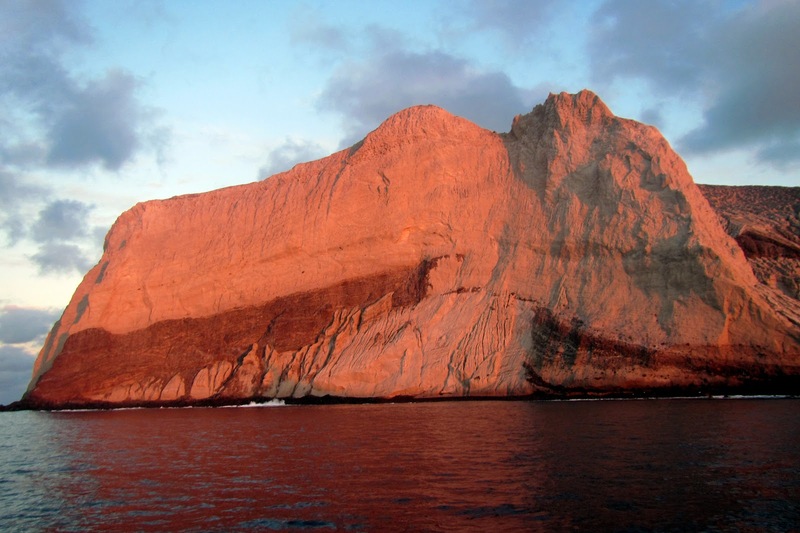 I donned my snorkel gear and went to look but with the late afternoon sun and the rock being the exact same color of our anchor and chain, I couldn’t determine if we were precariously anchored or not. If the anchor didn’t hold, the worst that would happen is we would drift harmlessly out to sea. If the anchor became jammed in the rock, it was only 30 feet down to free it. We spent a calm night there, both of us sleeping deeply for many hours. 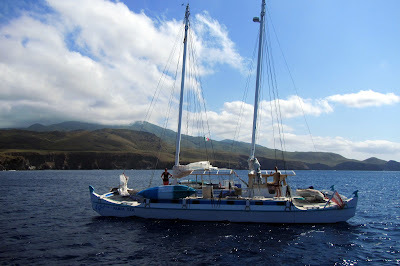 The morning was clear, calm and we made preparations to leave for Isla Socorro, about 35 miles to the south. With the thousands of anchor retrievals that Ruthie and I have done, our procedure is pretty routine. I’m on the bow, she’s at the helm and we communicate effectively with hand signals, eliminating the need for shouting which can sometimes be interpreted as anger. Even though we have anchored in some difficult places, the anchor has always come up albeit sometimes requiring some coaxing from a combination of pressure with the windlass and the force of the boat in either forward or reverse or both. Except this time. Despite our best efforts, the anchor refused to budge and the horrendous jerking that was being applied to both the anchor and the windlass was painful to me. Okay, this leaves us the option of me diving down to try to free the anchor, which I have never had to do. Whereas I know people who can easily free dive to 80 feet or more below the surface, I’m good to about 8 feet and even there only for a short time. Free diving to 30 feet and wrestling a 66-pound anchor is impossible for me. 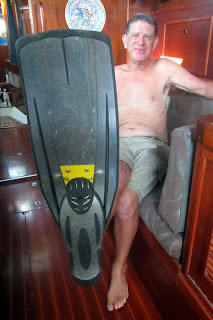 On board, we do keep a complete scuba set and when we were in Panama, I had sent our scuba tank out to be hydro-tested and filled – now I was grateful that I had done so. I hadn’t used any of the equipment since we were in Namibia many years ago and then it was a very shallow dive to free a friend’s anchor. Ruthie and I started to pull the equipment together. I got the scuba tank and weight belt out of the lazarette while Ruthie searched for the Buoyancy Control Device (the flack-jacket-look-alike that holds the scuba tank and provides buoyancy to float a diver on the surface, over coming the sinking effects of the lead weights) and the dive regulator, which connects the scuba tank to the diver’s mouth. We had everything ready to go except the absolutely-necessary regulator. I was on the aft deck and was talking to Ruthie who was in the aft cabin, tearing everything apart, desperately looking for the octopus-like regulator. The 2-foot by 2-foot hatch was propped open with a piece of slim teak trim as the friction hinges had worn out years before. I was poking my head down the hatch, trying to offer Ruthie ‘encouragement’ and ‘advice’ on where else the elusive regulator might be. Inadvertently, I knocked the teak trim supporting the hatch out of place and the hatch dropped quickly, hitting the back of my head, forcing my lower lip to smack sharply against the hatch dog. My lip burst open and blood spurted down my chin like a river. Great. Now I still have to dive into the waters that are known to be frequented by sharks with a bleeding lip. After literally tearing the entire boat apart, we finally found the hidden regulator (it wasn’t where our inventory book said it was supposed to be) and we lowered the dinghy as it makes an easier place to get in and out of the water with dive gear on. With the scuba tank attached to the BCD, I pressed the inflate button and the BCD filled with air – until I heard a ‘pop’ and the BCD quickly deflated. No matter how much air I forced into the BCD, it wouldn’t hold any pressure. Frantic, I poured over the little-used BCD, looking for a hole that might have formed during any one of our long passages but couldn’t find any. As a last resort, I took apart the pressure relief valve and found that it had stuck open. A quick wipe with my finger across the sealing surface, I reassembled it and it then held pressure. Whew! That could have been a show-stopper. Then I loaded sixteen pounds of weights onto my weight belt and slipped into the water, no wetsuit necessary. 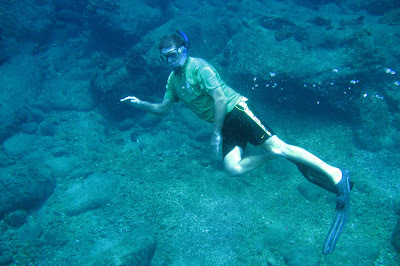 I floated like a cork, even with my BCD deflated. Frustrated and unwilling to go back to the boat to load more weights, I forced my way down the anchor chain to where the anchor lay jammed against the rocks. Once on the bottom, I could see that the anchor was wedged between two large rocks but it didn’t seem impossible to free it. I had taken a length of ½” line with me to rig as a trip line but I didn’t need it. As I got in position to lift the anchor, my hands briefly slipped off. Now, I started to float upwards quickly as my weight belt was too light. Frantically, I swam towards the anchor chain so I could arrest my upward trajectory. Going quickly from 30 feet to the surface probably wouldn’t have been bad but my training told me to avoid it at all costs. I forced my way back down to the anchor, muscled it out of its crevice and using the anchor chain, controlled my ascent to the surface, where Ruthie was ready with her foot on the windlass up switch, waiting for my go-ahead signal. With our anchor properly secured in its home on the bow roller, we pointed Rutea south towards Isla Socorro, the largest of the four islands. The wind filled in to about 25 knots out of the north and we had a good, fast sail, covering the 35 miles in about 5 hours. 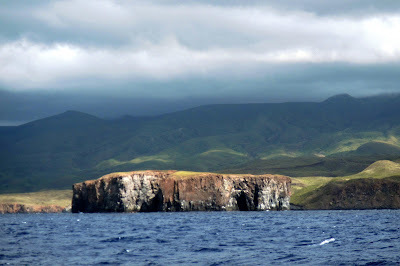 Isla Socorro looks nothing like its sibling to the north as it’s covered with green hills and steep black rock cliff faces. We left Roca O’Neal to port and made our way around the end of Punta Tosca, entering the relatively calm water where two boats were two boats lay at anchor. Friends of ours had given us specific coordinates of where to anchor and promised that we would find a sand bottom with good holding, despite it being almost 90 feet deep. We honed in on the waypoint and I lowered the anchor only to find more rock. We upped the anchor and tried a slightly different location. More rock. I retrieved the anchor again and Ruthie had a VHF radio conversation with Eliza on the Fraser 41, Serafina, who suggested that if we anchor right behind them, we’re likely to find sand. Her husband, Ted, said that he had dove from their boat to shore and it was sand almost the entire way. Our third time was a charm – I paid out almost all of Rutea’s 350’ of 3/8” high-test chain - and even though we would have liked to be further in towards the cliffs with hopefully more protection, we were comfortable enough although it was no where near idyllic ‘mill pond’ conditions. We invited Ted and Liza over for sundowners and discovered that they hail from Eugene, Oregon, which was once our home and from where Ruthie earned her under-graduate degree. Ted and Liza offered to take us snorkeling the next day. During my morning tour of the deck I found an unfortunate flying fish that met its demise after landing on our deck. 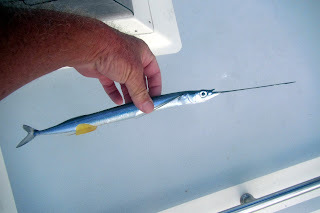 Without much thought, I tossed it overboard and within about 5 seconds, an 8-foot long silky shark came up and ate it. The shark was soon joined by a friend and the two circled around Rutea for hours. 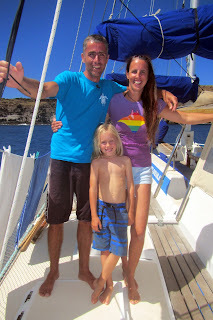 After our morning chores were completed, we hailed Ted and Liza on the VHF to see if their offer to show us some snorkeling sites was still good. They were up for it and we dinghied over to them in the early afternoon where Eliza joined us in our dinghy and Ted put his dive gear in their dinghy. We motored a short distance to a corner formed by the sheer rock cliffs, dropped the hook and slipped into the remarkably clear water. Ted took off on a dive by himself but Ruthie, Eliza and I just snorkeled in a small area, delighted with the amount of sea life we could see. Several days past and we developed a routine: Coffee and the single-side band nets first thing in the morning, chores, snorkel in the early afternoon and sundowners in the early evening. Various dive boats would come and go, none spending the night. On one of our snorkeling excursions, we took our respective dinghies to the far east side of the bay, just for a change of pace. 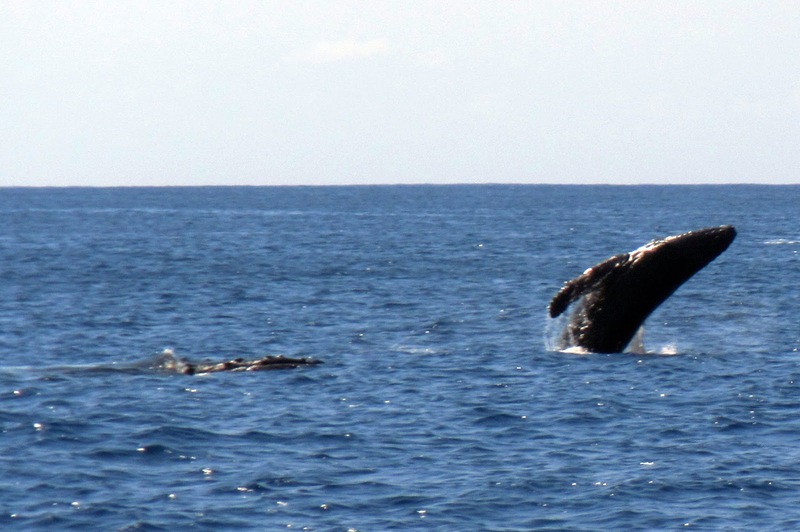 As we approached, a humpback cow and her calf appeared about 100 feet in front of us and despite her gentle movements, her mammoth size was intimidating. We stopped our forward movement but left our outboards running, hoping that the noise they generated would keep her apprised of our location. Once she and her calf sounded, we continued to make our way east but we spotted a giant manta ray just a few seconds later and Ted slipped in the water with his camera, intending to get some up close and personal shots of the remarkably graceful swimmer. The ray eluded Ted but it did go back by the dinghy where Eliza was waiting and with a powerful whip of one of its wings, gave her a generous salt water shower. Eliza was quite surprised and I laughed much too loudly to be polite. I stifled my laughter quickly, though, as I saw a large shark approach our dinghy. “Shark!” I said quickly and Eliza got Ted’s attention (who was still in the water) and she pressed both her hands together on top of her head, apparently the symbol of a shark in the water. Ted, nonplussed, made no hurry to get back to his dinghy. With Ted back in his dinghy, we continued towards our intended snorkeling spot and were discussing whether to anchor the dinghies or just tow them as we snorkeled. 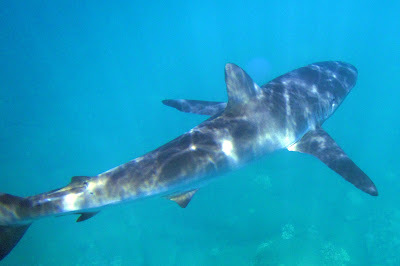 In the brief time we were talking about it, three large silky sharks showed up and began milling around the two dinks. Theoretically, silkies are unlikely to be aggressive towards humans but when you get a group of them together, one can egg on another and then another can join in on the fun and before you know it, they’ve gotten out of control. 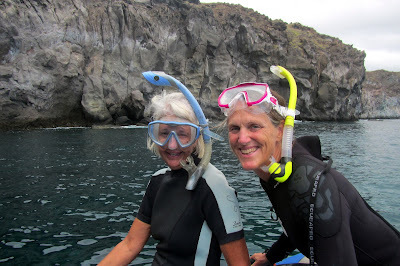 Collectively, none of us were interested in snorkeling around three large silkies and we made our way back across the bay to our standby snorkeling location where we felt more comfortable. 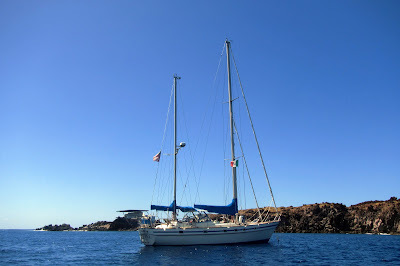 We had been in touch with our good friends aboard the 44-foot Wharrem cat, Pakia Tea, by email and we were delighted once they rounded Punta Tosca and anchored just ahead of us. This was to be our fourth rendezvous with them since we had met originally in the Maldives in the Indian Ocean and we always enjoy their company, especially that of 6-year old Keanu. Sonja, Keanu’s mother, has a long list of skills and accomplishments that includes being a marine biologist, a recorded classical singer and a terrific chef so Ruthie and I didn’t hesitate when she invited us over for coffee and cake just shortly after they had the anchor down. It was great to be back aboard Pakia Tea again and brought back pleasant memories of playing dominoes on their massive dining table that sits in between the two hulls on warm nights anchored off of some remote atoll in the Maldives. We had been keeping a close eye on the weather and had intended to sail back to Banderas Bay but when we saw a forecast with two days of light winds, it gave us the idea of motoring due north to Baja California. 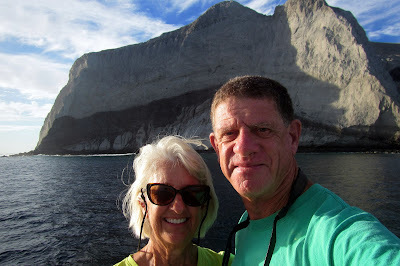 The bay at Cabo San Lucas was closest at about 250 miles but it’s not one of our favorite places so we set a course for Bahia Frailes, of which we have fond memories, which was almost 300 miles away. We expected that we’d have to motor the entire way but if we had sailed back to Banderas Bay, we probably would have had to motor from there north anyway. After saying goodbye to our friends on Pakia Tea, we left in the late afternoon, heading straight into the gentle swells. By midnight of the following day, a northwest wind filled in and we were able to cut the engine and sail, albeit close hauled, for about the next 12 hours, until we fell into the wind shadow created by Baja California. The engine came back on and in the flat calm conditions Ruthie and I made ourselves busy by wiping the boat down, cleaning the salt off of her and making her more presentable. It turned out to be a silly thing to do because once we rounded Punta Gorda, the wind filled in from the north at 27 knots and soon Rutea was pounding into steep, close-together waves. Even with the engine running at three-quarters throttle, sometimes we were down to just two knots of speed and it took us almost eight hours to cover the last 20 miles. The good news was that Bahia Frailes offered excellent protection and with the moon almost full, we were able to furl the main and drop the anchor without turning on the deck lights.